After Dam Failure, Thousands Flee In Myanmar Floodwaters are washing over residential areas in central Myanmar, driving whole villages of people from their homes. Authorities are conducting search and rescue operations for trapped people. Crowds of people have fled after a dam failed in the Bago region of central Myanmar. Floodwaters are washing over residential areas in Myanmar's Bago region, driving thousands of people from their homes after a dam failed. According to Reuters, officials say more than 50,000 people have had to flee. Authorities fear that thousands of people may still be trapped in their homes, Agence France-Presse reported. Rescuers are working "into the night to try to ferry residents out." 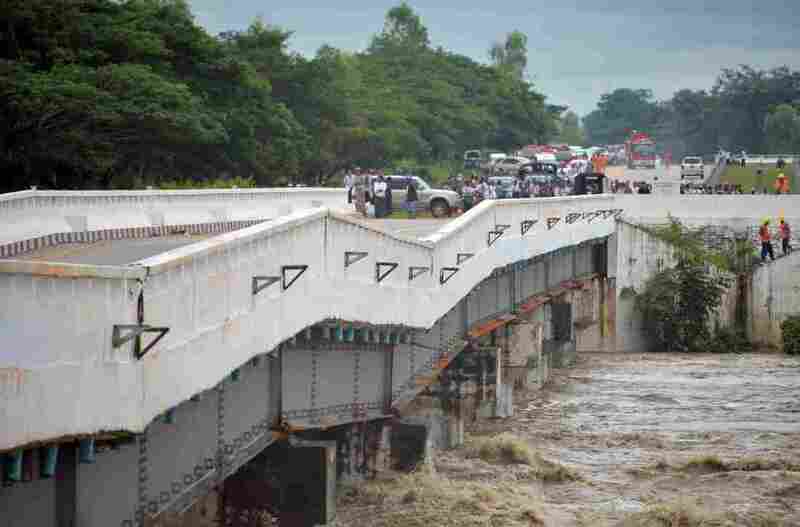 "The (spillway) of the dam was broken and flooded the two villages close to the highway," the fire department said, according to Reuters. Photos from the area show residents wading through murky water, carrying babies and helping to steady elderly evacuees. According to the local news site Frontier Myanmar, the fire department said that in some areas, the floodwater is 3 feet deep. It added that rescue workers say the levels have receded somewhat, but they're concerned about the possibility of more rain. "If you go to my house, there are no belongings left," farmer Aung Aung told Reuters. His village, Kone Gyi Lan Sone, has flooded. After fleeing to higher ground, he says he realized the extent of the damage. "The little shop over there is completely destroyed and washed away," he told the wire service. Officials are also surveying a major bridge that was damaged by the floodwaters. The concrete bridge appears to have cracked and is sagging in multiple places, above a fast-rushing river. The bridge connects two of the country's largest cities, according to AFP. Deputy Minister for Construction Kyaw Linn told AFP that he's concerned about how the flood may have affected the supporting towers of the bridge. "We will get divers to go down and check after the water levels recede," he said. It's not clear what, precisely, caused the dam to fail, though the area has been experiencing heavy rain. Reuters, citing state media, said local officials had inspected the dam a few days ago and said it was in good condition. "There is nothing to be concerned about," administrator Tun Nay Aung is quoted as saying. This isn't the first recent flood for the country. 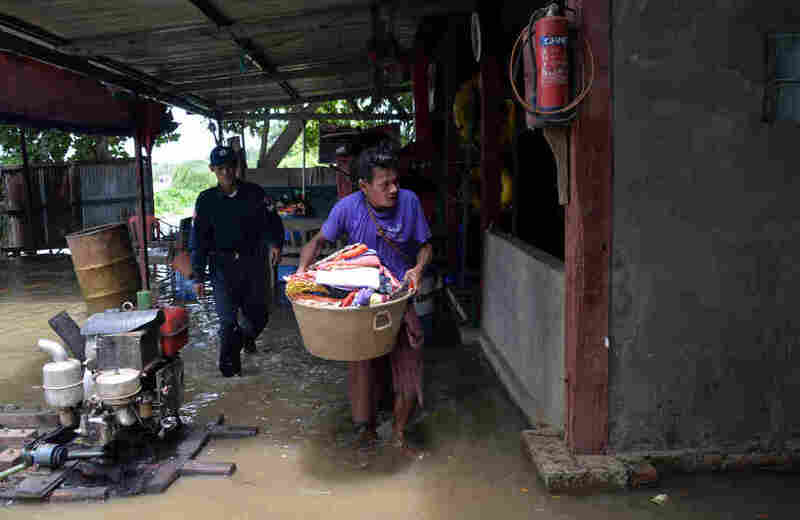 "The deluge comes just weeks after heavy monsoon rains pummelled Myanmar, causing widespread flash floods that forced some 150,000 people to flee their homes," AFP reported. Last month, flooding in nearby Laos also caused a dam to fail, killing at least 27 people, as NPR's Bill Chappell reported. 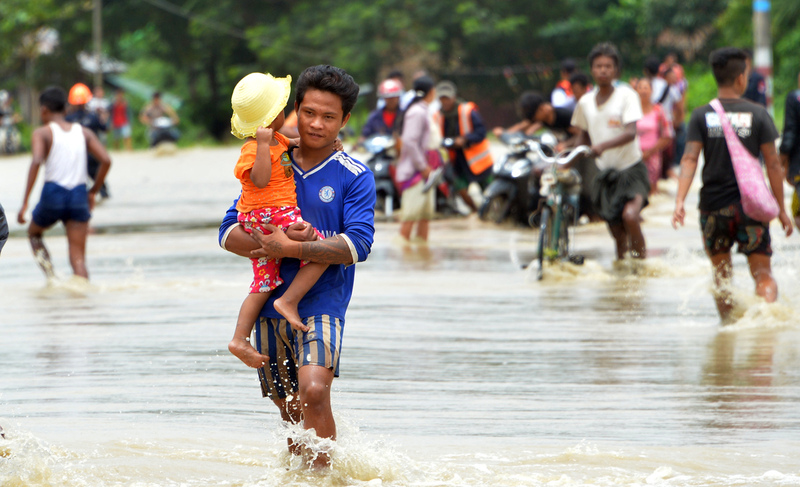 That flooding later spread to Cambodia, forcing 25,000 more people to flee in an area more than 40 miles away from the dam. 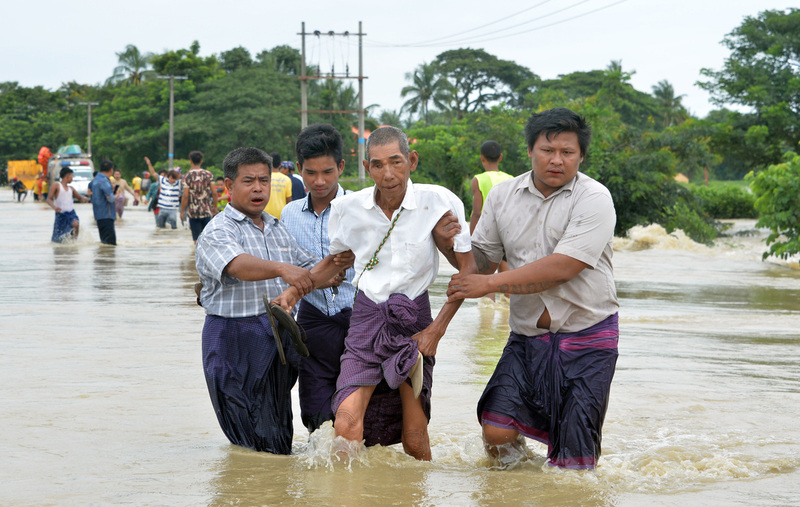 Central Myanmar residents negotiate a flooded road after waters submerged villages.